For most golfers, the hand and/or wrist is the third most common body region injured, after the back and elbow. The wrist is injured three times more frequently than the hand. In golf, the action of the wrist is important for the “snap” of the shot in long shots, and the precision “feel” in short shots. Golfers who lack strength in their forearms are more prone to wrist and hand injuries. The leading wrist/hand (left side for right-handed players, right side for lefties) is most at risk. Golf injuries result either gradually from overuse, or from a traumatic blow (hitting a root or a rock, or hitting a fat shot off hardpan) causing sprains (ligament injuries) or fractures (“broken bones”). The most common golf injury when it comes to wrist/hand complaint is due to tendonitis (tendon inflammation) of any of the tendons that cross the wrist. Treatment usually consists of rest, splinting, ice, and non-steroidal anti-inflammatory medicines. If these initial treatments fail, cortisone injections may be used at the discretion of your doctor. 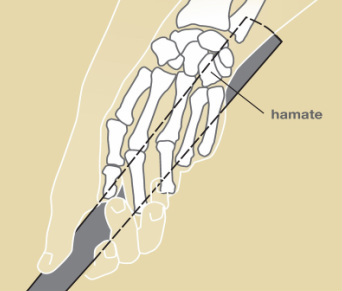 Another distinctive golf injury is fracture of the hook of the hamate, one of the small bones of the wrist. The hook is the particular part of that bone that protrudes toward your palm, and is vulnerable to injury from the club on a hard hit to the ground as the handle crosses right over the bony hook when gripping the club (see Figure 1, 1A). 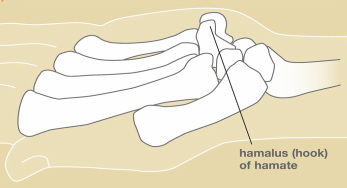 Hook of the hamate fractures may cause pain in the heel of the little finger side of the palm. If it irritates the adjacent ulnar nerve, it may cause numbness and tingling in the ring and little fingers. The tendons that bend the ring and little fingers are also adjacent to the hook, and movement of these fingers may be painful and give a sensation of “catching” or “clicking” if these tendons are rubbing on the fractured bone. Left untreated, the tendons can even gradually fray and rupture. In addition to physical examination, your doctor may obtain x-rays, but the fracture is often difficult to see on plain X-rays because of the overlap of the other small bones in the wrist. A special study called a CT scan is often used to visualize the area of the hamate hook in greater detail when a fracture is suspected (see Figure 2). Treatment may consist of splinting or casting if the fracture is seen very early after injury. If seen late and there is continued pain, numbness and tingling, or tendon irritation, surgery is usually performed to remove the broken bone fragment. Figure 1. Hook of the hamate as it grips a golf club. Figure 1a. Small bones of the wrist. Figure 1. 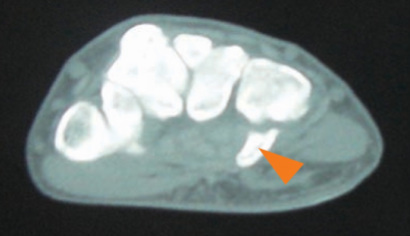 CT scan showing fracture of hook of hamate at its base. Figure 3. Elbow showing muscles as they originate from medial and lateral epicondyles. The elbow may be affected with “golfer’s elbow”, which is a painful tendonitis on the inner aspect of the elbow at the origin of the “flexor/pronator” muscles. 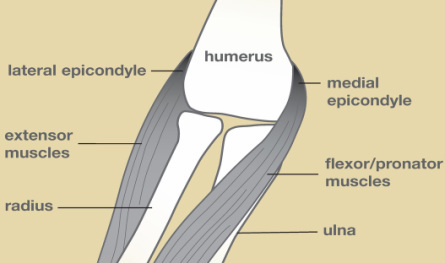 They originate off of a bony prominence of the humerus (arm bone) called the medial epicondyle, and so this condition is also called “medial epicondylitis” (see Figure 3). It can be caused by repeated swinging stress to the elbow, and may result from many other non-golfing activities, such as heavy lifting and hammering. Lateral epicondylitis or tennis elbow, on the outer side of the elbow, is also commonly seen in golfers from repeated strain to the lead arm, similar to hitting backhands in tennis (see brochure/web page on tennis elbow/lateral epicondylitis). Both these conditions are usually first treated with rest, a physical therapy program of muscle stretching and strengthening, and non-steroidal anti-inflammatory medicines. If these initial treatments fail, steroid injections may be used at the discretion of your doctor. In a small percentage of patients, non-operative treatment is unsuccessful, and your doctor may recommend a surgical procedure that entails removal of the degenerated part of the tendon and possible tendon repair. Another potential cause of golf injury is the unsafe use of golf carts. Golf cart accidents with fall-outs and tip-overs may cause very serious injury such as fractures to the wrist, forearm, elbow, arm, shoulder, tibia (shin bone), and ankle, among others Proper care and caution must be exercised when driving golf carts. Non-upper extremity golf injury is worthy of mention and includes sprains and strains of the back, especially the lower back called the lumbar spine. Proper warm-up and stretching is important to decrease the chances of injury. Gradual increase in length and intensity of play should be exercised as the season progresses.